IFC sponsors five USFA sanctioned tournaments each fencing season. IFC Fall Open Tournament - 11/30/2014: Senior Women's Foil, Senior Mixed Foil, Senior Mixed Epee, and Senior Mixed Saber. IFC Y12, Senior E & Under Tournament - 2/22/2015: Y12 Mixed Foil, Senior Mixed Foil, Senior Mixed Team Foil, Y12 Mixed Saber, Senior Mixed Saber, Senior Mixed Team Saber. IFC Y12, Senior D & Under Tournament - 3/22/2015: Y12 Mixed Foil, Senior Mixed Foil, Senior Mixed Team Foil, Y12 Mixed Saber, Senior Mixed Saber, Senior Mixed Team Saber. IFC Dominick Epee Challenge - 4/26/2015: Y12 Mixed Epee, Senior Women's Epee, Senior Mixed Epee, Senior Mixed Team Epee. IFC Youth and Veteran tournament - 5/21/2015: Y10 Mixed Foil, Y12 Mixed Foil, Y14 Mixed Foil, Y12 Mixed Epee, Y14 Mixed Epee, Y12 Mixed Saber. 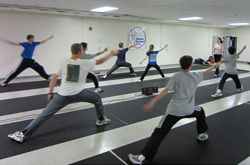 IFC offers a continuing program of fencing classes of 8 to 10 weeks in duration for kids, teens, and adults. Classes include Introduction to Fencing for Kids, Intermediate Foil, Advanced Foil, Intermediate Epee, Advanced Epee. Adult classes include Introduction to Fencing and Fundamentals of Epee Fencing. Learn More. IFC offers three one-day clinics each fencing season for competitive fencers taught by Ina Harazanova.